Note: This article first appeared in CVu Issue 17.5 (October 2005). CVu is the journal of ACCU, an organisation in the UK dedicated to excellence in software programming. Some links may not work. This article demonstrates a technique for tracking exceptions across process boundaries in distributed systems using Globally Unique Identifiers (GUIDs); data from log files, bug reports, and on-screen error messages can then be correlated, allowing specific errors to be pinpointed. Particular attention is paid to XML Web Services, with additional reference to DCOM, CORBA, Java/RMI and .Net Remoting. The examples are given in C# [.NET 1.1], but the technique can be applied easily to Java and other languages. When dealing with modern distributed applications, it is often very useful to track an exception as it crosses process and machine boundaries. A comprehensive picture of the “distributed error” can then be constructed from log files of the different applications and components affected. Languages such as C# and Java have an inbuilt mechanism to provide detailed error information – the Exception Stack Trace – which helps greatly to identify the source of runtime application errors. However, this information in itself does not always provide the full picture of an error condition. The approach outlined here uses GUIDs (see Sidebar: GUIDs) effectively to “tag” exceptions before they leave one part of an application and appear in another. This allows exceptions to be tracked irrespective of whether the application is stand-alone or distributed, and irrespective of the transport, protocol or component architecture used. GUIDs are generated using a variety of data, such as the current date & time, the IEEE 802 (MAC) address of the machine’s network card, etc.. This is designed to ensure that the likelihood of generating the same GUID twice is very small. There are UUID/GUID implementations for many different languages and platforms (see Sidebar: GUID Implementations), and even an online GUID generator . In addition, it is easy to identify GUIDs written in the standard string representation (above) using Regular Expressions. Note: UUIDs/GUIDs should not be confused with GIDs/UIDs on *nix systems! XML Web Services is the name given to the latest class of middleware technologies designed to provide cross-platform Remote Procedure Calls (RPC). Previous technologies such as DCOM, CORBA and Java/RMI all have strengths, but often suffer from implementation difficulties, and none is really both platform- and language-independent , . Web services are a new breed of Web application. They are self-contained, self-describing, modular applications that can be published, located, and invoked across the Web. Web services perform functions, which can be anything from simple requests to complicated business processes… Once a Web service is deployed, other applications (and other Web services) can discover and invoke the deployed service. Web Services can be discovered and used automatically using UDDI , due to Web Services being “self-describing” via WSDL . All these properties make XML Web Services very attractive for building scalable, flexible distributed applications. For a more comprehensive introduction to XML Web Services, see . SOAP is fundamentally a stateless, one-way message exchange paradigm, but applications can create more complex interaction patterns (e.g., request/response, request/multiple responses, etc.) by combining such one-way exchanges with features provided by an underlying protocol and/or application-specific information. Although SOAP does not specify a transport protocol, HTTP is normally used. With the resultant “SOAP-HTTP Binding”, XML Web Services using SOAP and HTTP rely on message exchange using a combination of an HTTP Header and SOAP (XML) payload. Notice the standard HTTP POST request (first five lines), and that the SOAP payload (the GetBookDetails element) is simply XML. The XML payload contains a root element GetBookDetailsResponse that is the response to the original GetBookDetails request. Real-world SOAP messages would be somewhat more complex, but the principle above remains. For a much more comprehensive overview of SOAP, see . We will return to the SOAP Fault shortly. 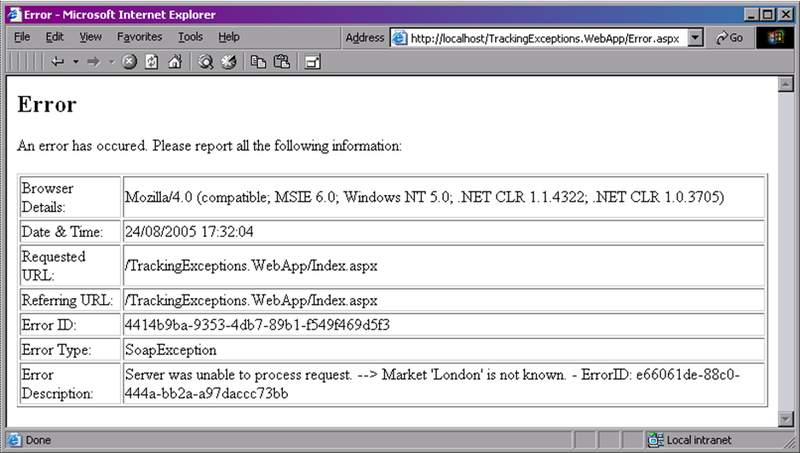 Figure 4 shows how information about an error in the Web Service method is transmitted back to the calling client. Thus, if the Web Service were to create a unique identifier for the error, and pass that identifier back to the client, we would be able to track that specific error as it travels across machine/process boundaries. Assuming that the error is logged in both places, we would have a way to link together error information from one application component with that from another. The TrackedException class in Figure 5 automatically creates a new GUID in its constructors. Derived classes therefore do not need to concern themselves with GUID creation: in fact, they cannot, as the constructors relating to GUIDs are protected. Other useful base class constructors could be defined (e.g. matching the signatures of System.Exception), also priming the ErrorID property. Wherever a TrackedException is thrown in code, we know that it will have a GUID-based ErrorID property, which we can include in log file data. The call to the hypothetical ExceptionHelper.WrapDetails() method returns a System.Xml.XmlNode object that will be inserted into the SOAP Fault response XML payload. 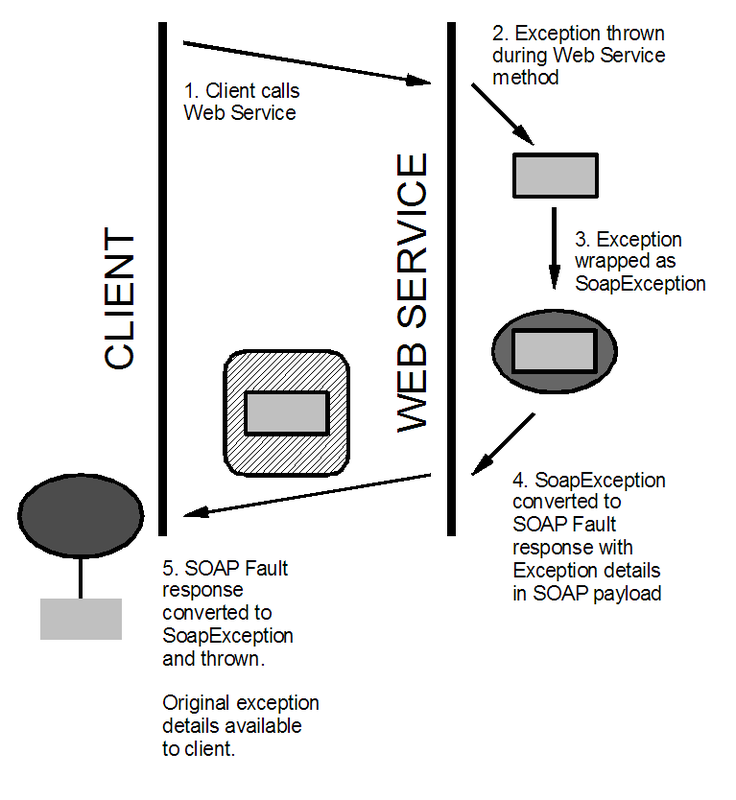 The Details property of the SoapException at the client contains the XML from the XmlNode that was inserted in the catch handler of the Web Service method: the GUID of the original exception (see Figure 6). Logging this at the client will allow us to tie together the error logs from the two applications; showing the GUID to the user (see Figure 8) would allow her to copy/paste the GUID into a bug report (for example), further correlating the error information. The same GUID appearing in different log files will refer to the same exception instance; due to the nature of GUIDs (see Sidebar: GUIDs) we can assume that a GUID will never be duplicated. There is an advantage in presenting only a GUID rather than detailed error information to the user: it may not always be appropriate to divulge the details of an error (for security reasons, for example). The GUID acts as an opaque handle to the already-logged error; a bug report containing just the GUID should be enough to put that report in context. Some CORBA implementations already provide for a way to associate extra information with the exception – see . The constructors ensure that a GUID is associated with the exception (as in Figure 5), but also automatically store the string version of the GUID in the Message property of the exception, by modifying the data passed to the base class constructor. This approach sacrifices encapsulation for the ability to track exceptions across process and machine boundaries. Logging the received error message would still allow the correlation of error information from the various parts of the distributed system, because the original exception GUID is stored in the error message. // e.g. StackTrace, Message, etc. Arguably, the need for a separate TrackedException class is removed with C# 2.0, because any and every exception can have a tracking GUID associated with it, stored as a named entry in the IDictionary Data member, rather than needing a separate property ErrorID. The concept of exception tracking presented in this article is similar to the idea presented in  and , where contextual information associated with an exception is maintained for later analysis. This article extends the idea across process, machine and protocol boundaries, however, relying on offline log file analysis to restore the contextual information. The overhead associated with generating and transmitting a GUID may be unacceptable in some cases. However, in most situations, the benefits gained from being able to track exceptions using a string of 30-something characters will probably outweigh the slight performance hit. An example project demonstrating the ideas in this article is available from [www.accu.org]. This article demonstrated a simple scheme to track exceptions across Web Services and other distributed systems using GUIDs. The benefits of using this scheme become apparent when the need arises to correlate information from multiple error logs and bug reports: the details of specific exceptions can be reconstructed at a later stage, and problems diagnosed more thoroughly. A prototype of this scheme has been in operation for several months for a real-world project using SOAP Web Services (http://www.lamip.org/) and proven to be very useful indeed. Thanks to the Editor, Paul Johnson, for requesting this article. [A] Web Services in .Net can also be built ‘from scratch’ if required. [B] There are similar implementations for Java: see  for an example. [C] Technically, it will also be necessary to ensure that the class is serializable. For a C# class with simple (serializable) fields, it is sufficient to mark the class with the [Serializable] attribute. [D] The target COM Object could be made to support the IErrorInfo interface, which could then be queried for the exception GUID. [E] See also http://udk.openoffice.org/common/man/uno_the_idea.html for an interesting discussion on Java/RMI, CORBA and DCOM.